The Mayan Empire, which thrived in modern-day Guatemala, was the epitome of power and prosperity during the sixth century A.D. It was one of the most superior societies of Mesoamerica (Mexico and Central America). The Mayans showed excellence in the fields of agriculture, pottery, hieroglyph writing, calendar development, and mathematics. The earliest Mayan settlements that have been recorded date back to 1800 B.C., which may be referred to as the start of Preclassic Period. What set them apart from the other civilizations was their place of residence. Whereas, a majority of the civilizations before, during, and after Mayan times were often dispersed in several different areas or even cities, the Mayans would remain in one block of an area; this was the geographical block that would cover the Yucatan Peninsula along with Guatemala. This also meant that the Mayans remained secure from any attacks of the other empires and tribes present in the Mesoamerican region. The Mayans would show great advancement in their agricultural techniques and were able to harvest crops such as corn, beans, squash, and cassava. They were also very apt at building pyramids, constructing cities, and etching stone monuments. The golden age of the Mayan Empire came during A.D. 250 when the Mayan society inhabited around 40 cities at the time. Each of its cities would hold up to 5,000 or more people, and the entire population of the Mayan empire racked up to 2,000,000 people. 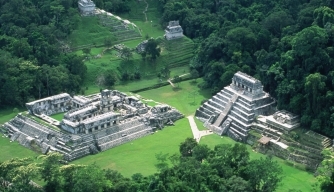 Mayan excavations have helped with the discovery of palaces, temples, plazas, and pyramids being built by the Mayans. The farmers of the Mayan Empire made up the major segment of the population and they would often use advanced irrigation and terracing methods. The Mayans also proved to be extremely devout and would worship several gods. Their gods had been categorized into different worldly elements such as the God of Sun, God of Moon, God of Rain, and God of Corn. The kings of the empire would come in second in the hierarchy, after the gods. The kings would claim and be considered people related to the gods and acted as the messengers of gods and the people. They would come in power through hereditary succession and also performed religious ceremonies and rituals pertaining to the culture. Starting from the later eighth century to the end of the ninth century the Mayans had slowly started to abandon their homes in the Mayan cities and dispersed. No one really knows the reason for such a move but some scholars assume that this was possible because of the exhaustion of the natural resources of the cities. Amita Vadlamudi writes extensively on history and ancient cultures. Her resume and her various other works and interests may be found at the following sites. Where Did the Maya Live? Amita Vadlamudi is a computer systems engineer who has spent 35 years in the information technology industry. Additionally, Amita Vadlamudi enjoys studying and learning about ancient cultures, such as the Mayans and the Incas. The Mayan civilization flourished in Mesoamerica (the name used to describe Central America and Mexico as it existed before the Spanish conquest in the 16th century). Unlike other indigenous populations of the time, the Maya were centered in one region, covering what are now known as the Yucatan Peninsula, Guatemala, Belize, Honduras, El Salvador, and parts of the Mexican states of Chiapas and Tabasco. Because of this concentration, the Maya were relatively safe from invasion by other Mesoamericans. Within this region, the Maya occupied three different areas, each with its own environment and culture. One group lived in the northern lowlands on the Yucatan Peninsula, while another group resided in the southern lowlands in what is now the Peten district of northern Guatemala as well as nearby parts of Mexico, Belize, and Honduras. A third group lived in the southern highlands in the mountains of southern Guatemala.